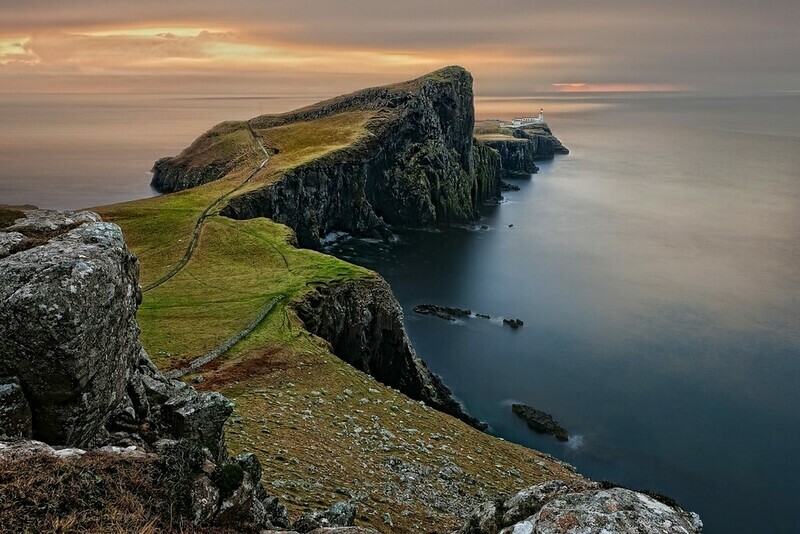 The Isle of Skye Scotland is one of the most beautiful areas in the UK with dramatic landscapes surrounded by water. 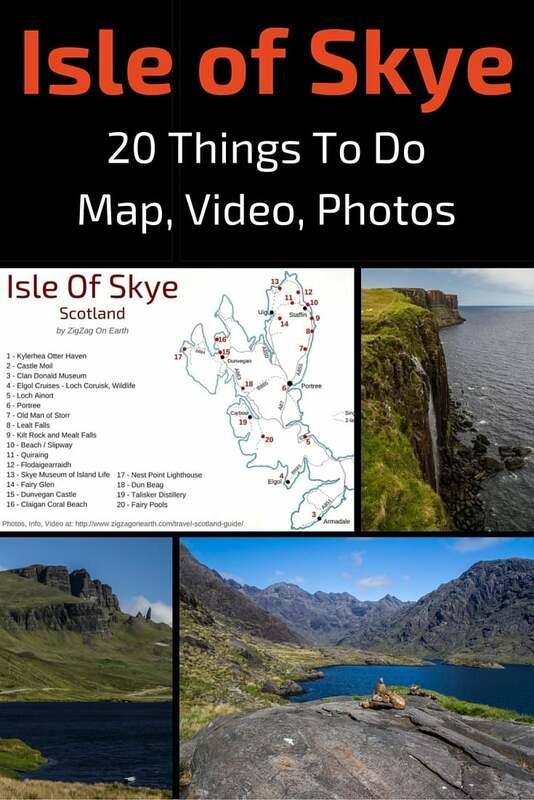 Below is a guide to help your plan your trip and make the most of your time: things to in Skye Island Scotland, Photos, video and and Isle of Skye Map to get your started. This article contains affiliate Links (info on the Disclosure page). If you purchase using my link, I get a commission at no extra cost to you. Do you understand why it made it to my list of Best Scotland Destinations? Photos of the Top 20 things to do are coming after the practical information about the island of Skye. 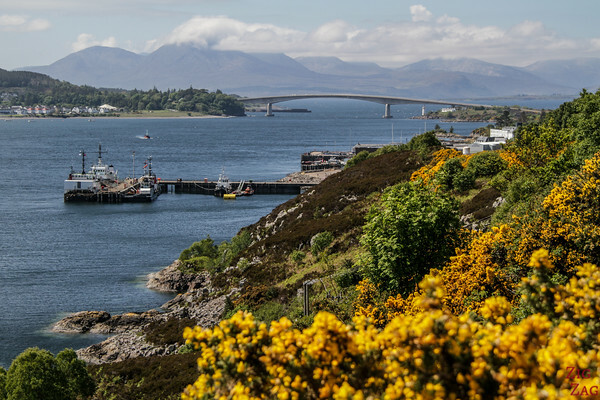 The easiest access to Skye island, is the Skye Bridge at Kyle of Lochalsh. From Glasgow take A82 then A 87. The Road trip via A87 along Glen Shiel and Loch Cluanie is one of the best drives in Scotland. You can take the ferry with your car or on foot (a train runs from Glasgow to Mallaig). If you don't want to drive, and want to enjoy some explanations along the way, you can book an organized tour from Edinburgh. 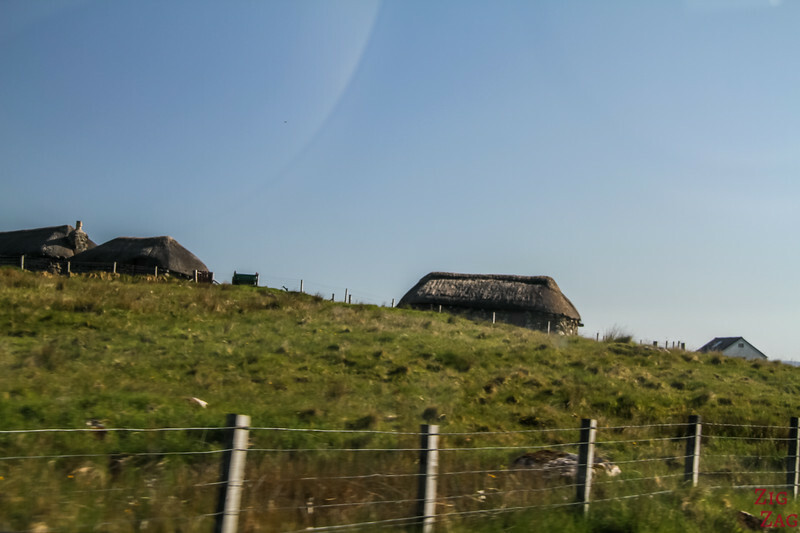 Other options are available, check out my guide about choosing your Isle of Skye Tour from Edinburgh, Glasgow or Inverness. Mostly you have to take the bus to Portree and then use the island bus system to get around. The island is large and the bus not so frequent so I strongly recommend hiring a car. From Edinburgh, take the 900 to Glasgow and then buses as listed above. 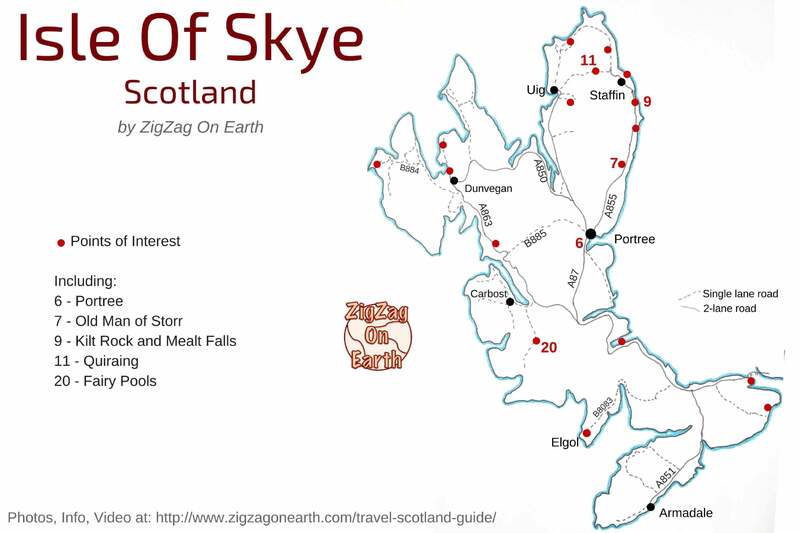 The isle is a lot bigger than one imagines and there are a lot of things to do in Skye island. Just the drive from the bridge to Portree takes 1 hour! And that's on a main road. Many other roads are small single lanes. When there is a lot of traffic on the single lane roads, time can double as you stop all the time. How long to visit the Skye? I recommend at least 3 days to really enjoy all that the island has to offer. Be aware that accommodations get booked very fast, this is one of the most popular places in Scotland. Plan ahead! Don't come to ​​​​​the island without a place to stay(especially in June and July). So don't book at the last minute, almost everything will be booked and you will have to pay more. Book at least 3 months in advance, more if possible. 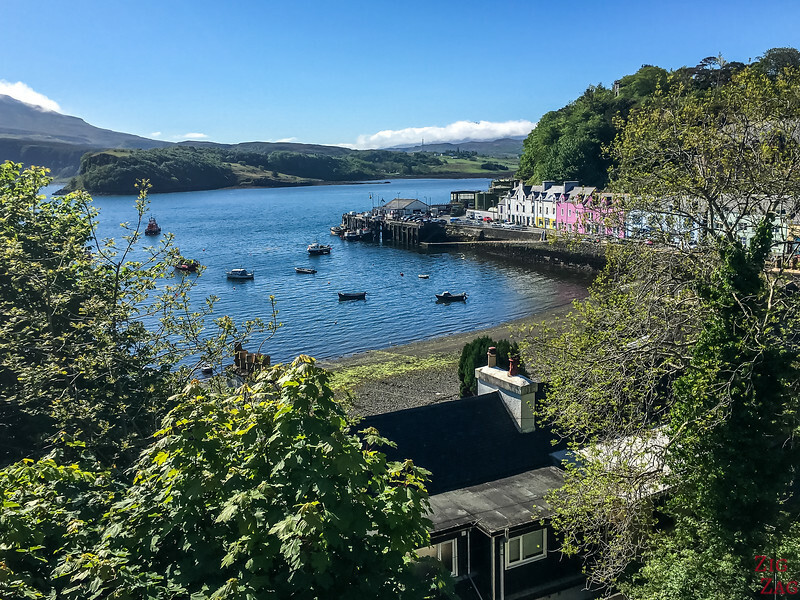 If you are wondering where to stay on the Isle of Skye, Portree is the main town and quite central. You will find all you need, including restaurants and shops. But if you are looking to be closer to nature, there are also many options off the central area. But then it means more driving to reach all areas of the island. Note: many accommodation reviews complain about the Internet. This is a general issue on the Island and should improve over the coming years. WHERE I STAYED - I stayed in Portree but as I booked only 2 weeks in advance, all was full and I had to go over budget. The Quayside apartment was beautiful and right in those famous colorful houses. See my full review on the Scotland Accommodations. 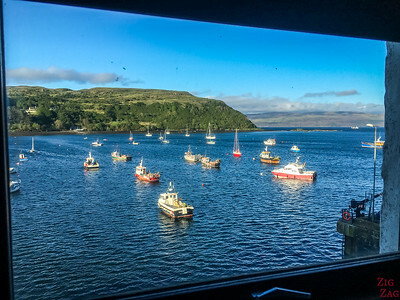 BUDGET - The Portree SYHA Hostelling is a good option for those looking for a cheaper option. 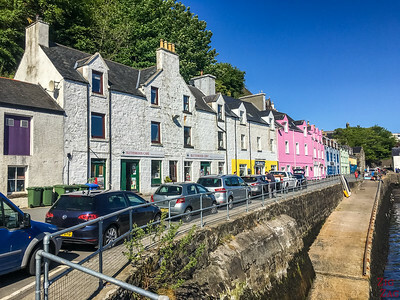 It has a great location in Portree. Very practical! Check photos and prices! 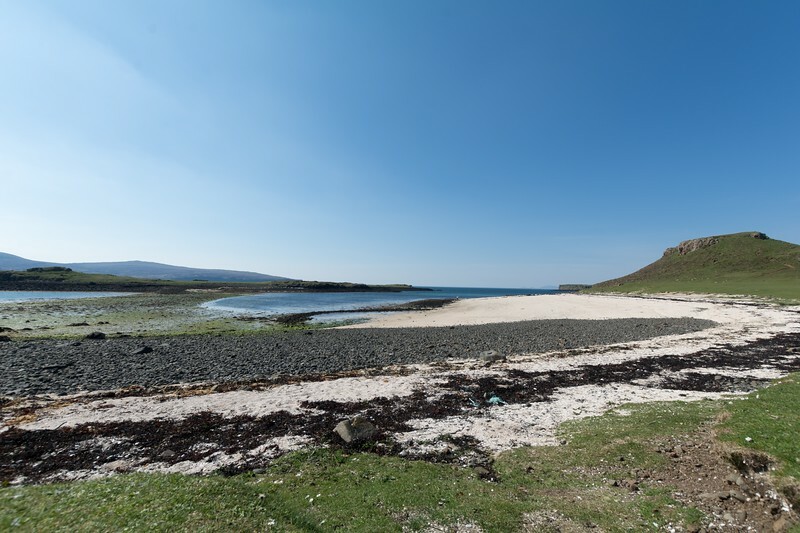 ISLE OF SKYE CAMPING - If you prefer to bring your tent and camp, there are few campsites on the island - I am not an expert, so I let you have a look at this page that presents you 3 campsites. Now let me show you some of the amazing attractions on the isle of Skye with some pictures. There are many points of interest and incredible views everywhere, but I have narrowed it down to my 20 favorite. Sadly, the weather is often clouded. It still is great but not really practical for photography. Icon of the isle of Skye, the pinnacle can be seen from far away on a clear day. 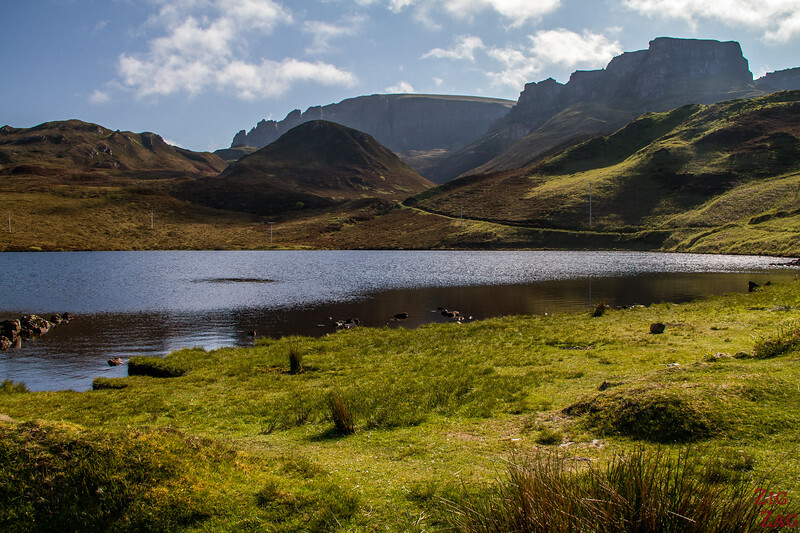 Part of the Trotternish ridge, it is one of the most famous walks. Definitively one of the top things to do in Skye island. However I was not feeling well enough, so I admired it only from the distance. Discover it from many angles and get information about the walk on the Old Man of Storr Skye article. 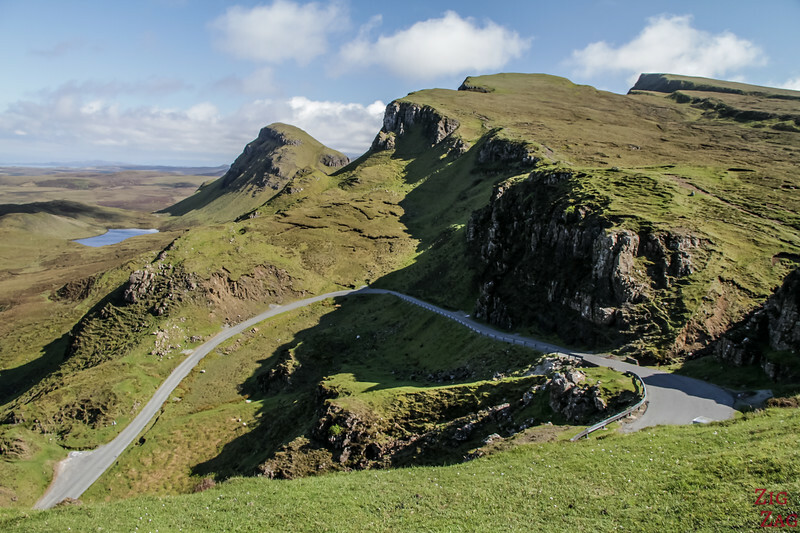 Another one of the top things to do in Skye island : Getting up to the views of Quiraing. The 10min drive on a single track will take you to a large parking (don't park on the way up). From there you can walk around and admire the views which can be all the way to the sea on a clear day. 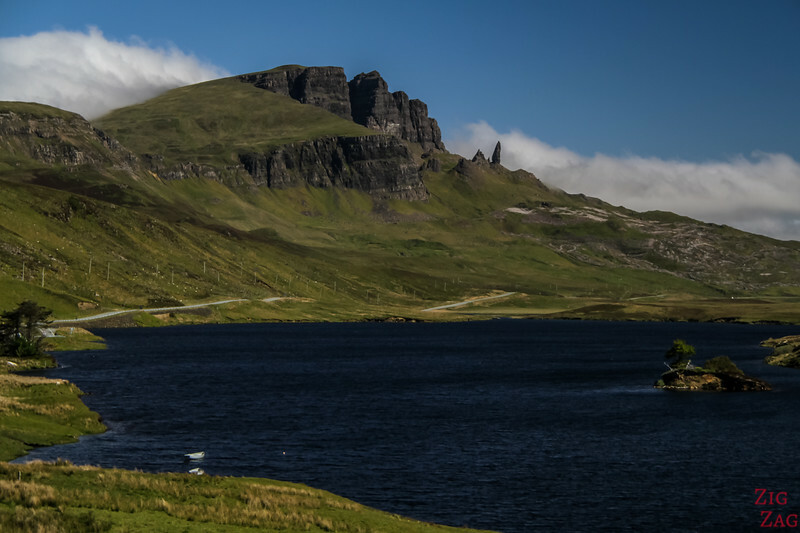 Discover more about Quiraing Skye with photos, video and information. 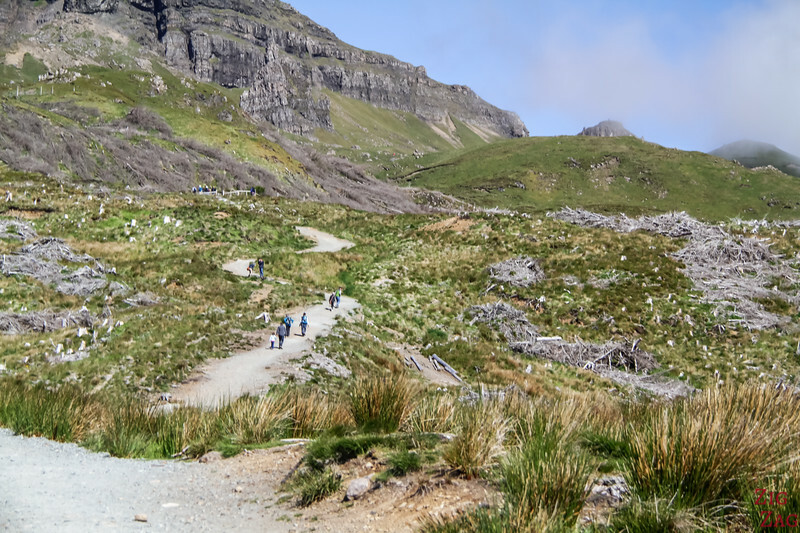 One of the top things to do on Skye island is the popular walk to the Fairy pools. The walk includes some river crossing and steep sections. 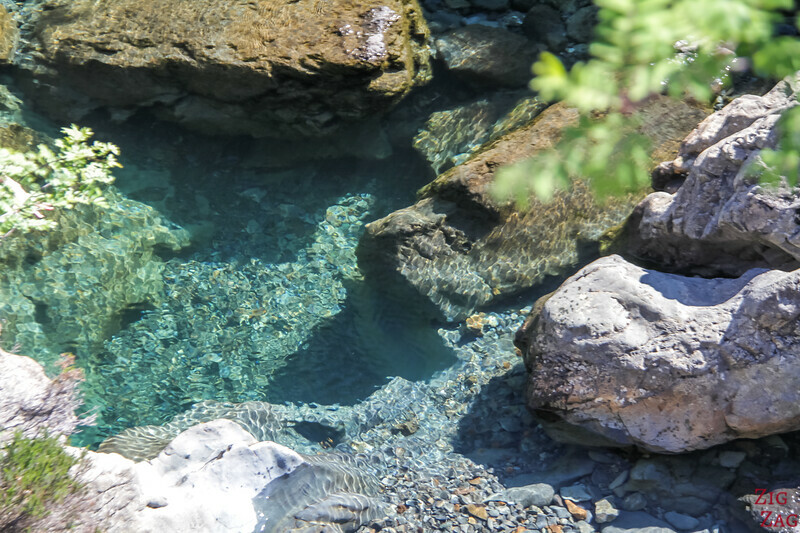 It takes you to a series of small pools with crystal waters. And on clear day, you can see them with the impressive backdrop of the Cuillin mountains. Whatever the weather you will not be alone. It gets really busy. 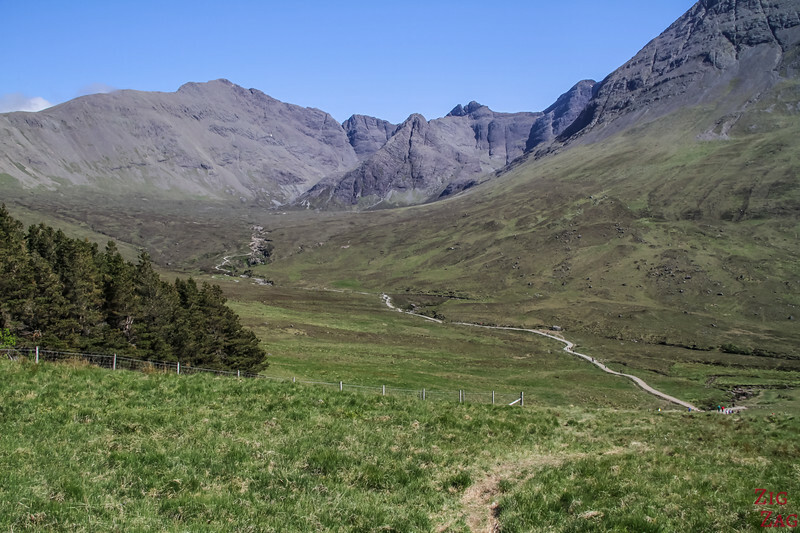 Photos, Video and info to plan your walk on my Fairy Pools Skye article. 2h return walk from the Fairy Pools Parking. Cruises depart to Loch Coruisk and to see wildlife (seals, whales, puffins...) on the nearby Scottish island﻿﻿s of Eigg, Rum and Canna. Elgol cruise Parking: access to Elgol is via B8083 a single track road (30 min drive from the main road). Discover photos, video and information in my Elgol Boat Trip to Loch Coruisk and Cuillin Mountains article. In the South of Skye, the Clan Donald Skye estate covers 20000 acres around Armadale Castle. There you can learn about the Highland history. Opened from end of March to October. Check out opening hours and prices. Loch Ainort is not identified as an Isle os Skye attraction. Yet, this was one of my favorite locations in the island. Have a look at the many pictures on my Loch Ainort article. The surrounding Red Cuillin mountains are beautiful. 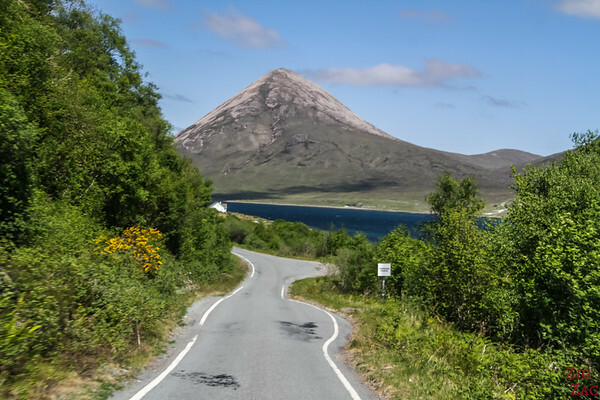 And you will not miss it as you have to take that road to get to Portree. The town next to the Loch is Luib. Portree is the main town in the isle of Skye. It is famous for its enclosed bay and its colorful houses. It is quite central, so a good place to base yourself while you are there. Wildlife Cruises leave from Portree as well as organized tours on the island. The path from the parking takes you to some beautiful cliffs but it is when you come back that you realize that the attraction was the Lealt Falls (not to be confused with the Mealt falls which are at Kilt Rock - see below). From what I read, hiking is possible to the bottom of the falls but rough and dangerous with the tide. 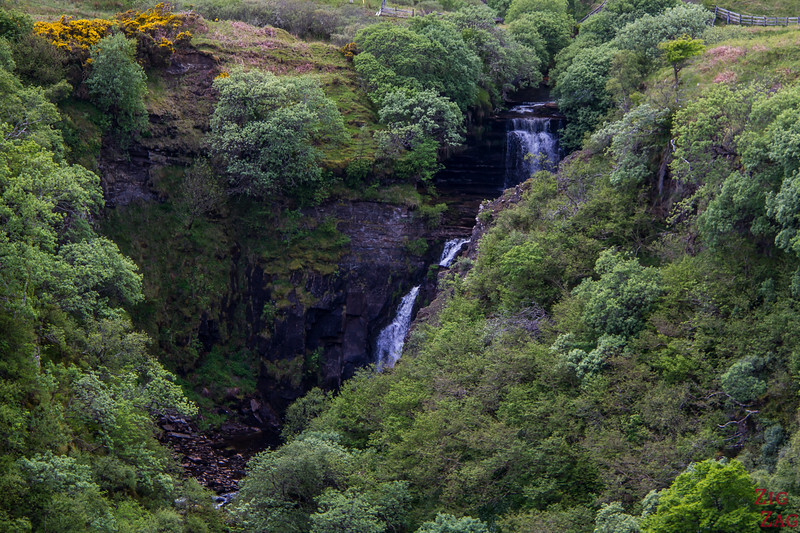 More photos and information about Lealt Falls in the the Eastern cliffs of Skye island article. 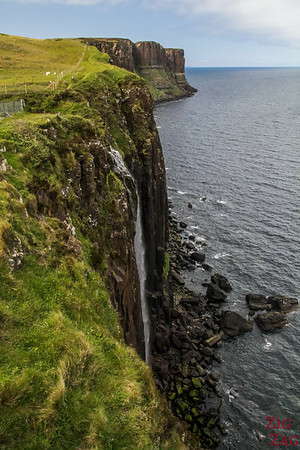 One of the most famous Isle of Skye things to do is admire Kilt Rock. The basalt columns along the cliffs mimic a kilt and the waterfall of Mealt drops straight into the ocean (if there is no wind). More photos, video and information on my Kilt Rock Skye and Mealt Falls article. 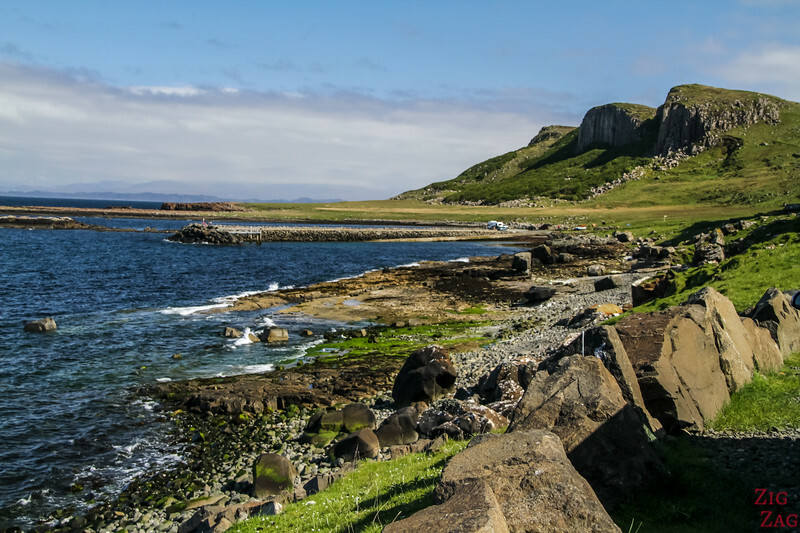 The road right after Staffin will take you to its beaches and beautiful cliffs. A stop I was not expecting but really loved. As we drove towards the northern tip of Skye island, I spotted a parking. A short walk took me to the beautiful Loch Langaig and the mountains behind. Photos and information on the article about the Duntulm castle and the North of Skye. Off the beaten track, the miniature features of Fairy Glen Skye (mini mountains, mini lochs), create a magical and peaceful area. And quite unexpected. Discover this attraction into more details: video, photos and planning info on my article Fairy Glen Skye. 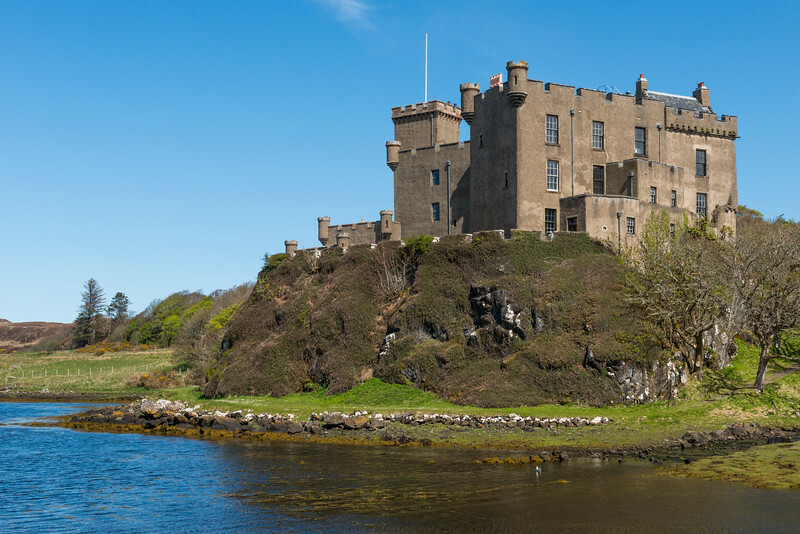 Built on the shores of Loch Dunvegan, the castle and its garden are a classic visit on the Isle of Skye. 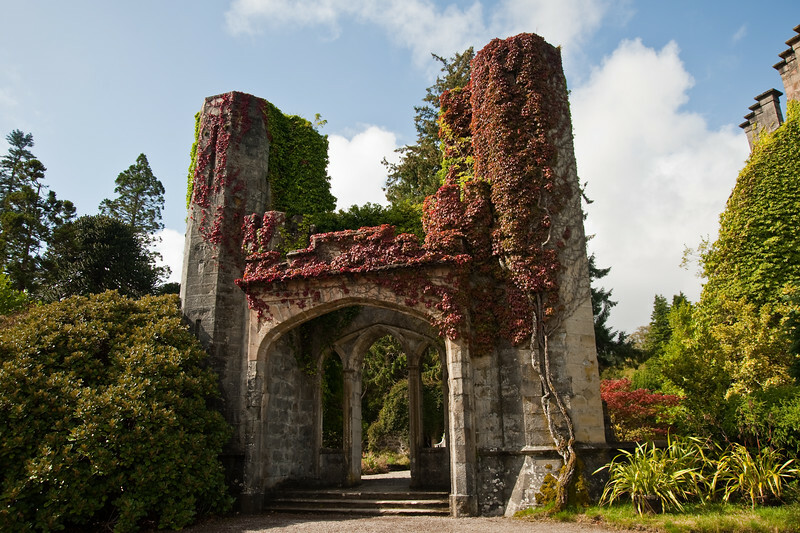 A visit inside will let you discover oil paintings, treasures from the Clan MacLeod and the famous Fairy Flag, which legend says has miraculous powers. Opening hours and prices on the Dunvegan Castle website. Skye Island has several beaches that deserve a stop, especially in the North. I had selected Claigan as one of the most beautiful beaches on the Isle of Skye. Sadly we ran out of time to go see it. The Nest Point cliffs are one of the most famous locations on the isle of Skye. However it is quite isolated and requires a 30min to 1hour drive on a single lane road (depending on traffic). And you might have to cross with buses. In this case also, we ran out of time and I was not able to see it myself. 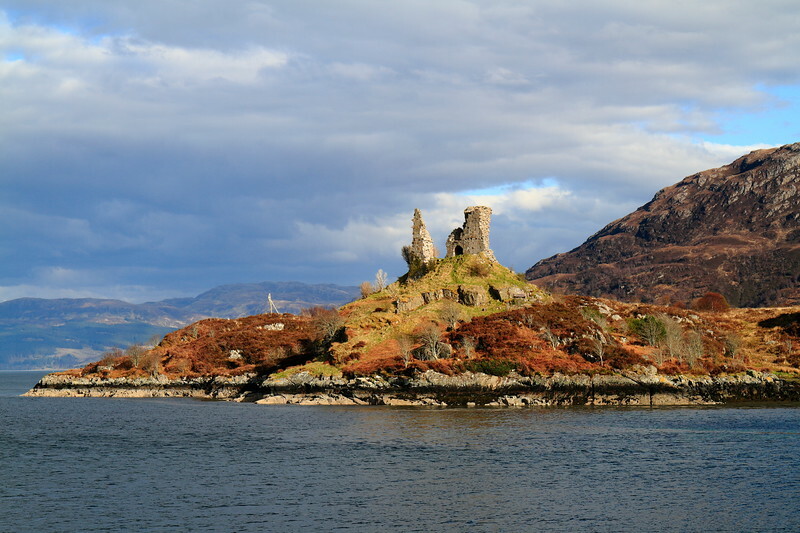 The ruins of the castle are located on a promontory near the village of Kyleakin. Discover more on Wikipedi﻿﻿a. You can admire it from the village or complete the walk around it (3.5km, 1.5h). As you can see, there is not much left, so I skipped it. Easy walk with nice views over the Kyle straight to the mainland. Stop by the water and be patient to spot otters. You can also see seals, birds and other wildlife. Take your binoculars! Picnic tables and toilets near start. 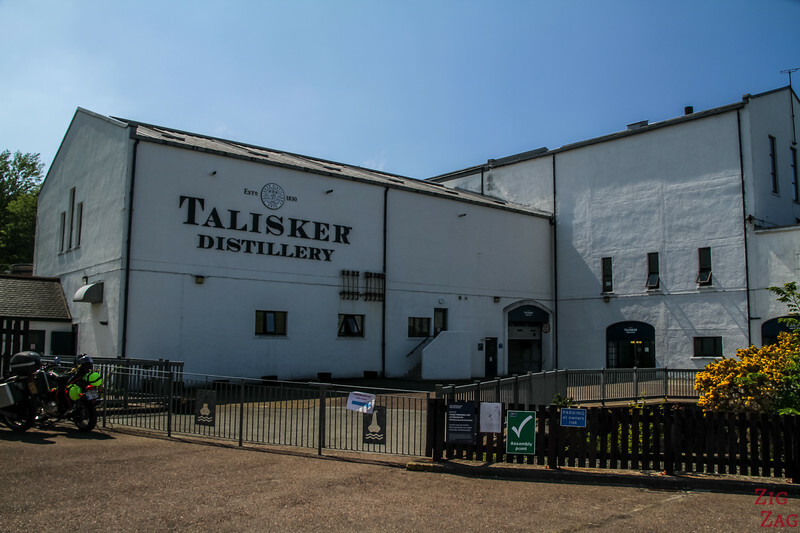 The Talisker distillery is located near the town of Carbost. Tasting tours are available on some days. Make sure you call and book. As it is the only distillery on the island it gets quite busy. I just went to the shop and did not complete the tour. The shop section was very touristy and commercial. Compared to another distillery I visited later on my trip, with this one we could not get any help from the people on selecting whisky... way too crowded for my taste. For those who love hiking, There are a lot of things to do in Skye island, from easy flat walk to challenging ridges. If you want the complete list check the WalkHighlands website section for the isle of Skye. And for each walk, click on the user reports line to get reviews from people and often pictures of their own walks. The wettest months are September to January and the driest are April and May. So of course, you need layers layers and layers. So that you can add and remove as you need. At the end I took the same as clothes as for Iceland without the thermal pant underwear. You can have a look at my Iceland Packing list to get inspired. And I recommend traveling with binoculars to watch the birds and admire the details in the rocks and mountains. Check out my guide to find the best travel binoculars for your needs. Its name is probably a combination of 2 Norse words : Ski meaning cloud, and Ey meaning island. Probably because there is almost always big clouds stuck over the island. lol. The Skye terrier is a breed that originated on the isle of Skye. Queen Victoria loved them. They are now rare. After your trip around the island of Skye, you can also take a ferry from Uig to get to the Outer Hebrides of Lewis and Harris. Those Scottish islands offer beautiful white sand beaches and a famous stone circle. You can recharge your batteries there, away from the world and close to nature. Want to see more of SCOTLAND? Discover more things to do & places to see in my Travel ﻿﻿Scotland﻿﻿ Destination Guide. Which ones do you want to enjoy? No, I have no guide just for the isle of Skye.